From Art Acevedo, who aided the fedgov to take forcible blood draws at random stops in Travis County in violation of constitutional protections – protections from people exactly like Art Acevedo – to something apparently just as bad. 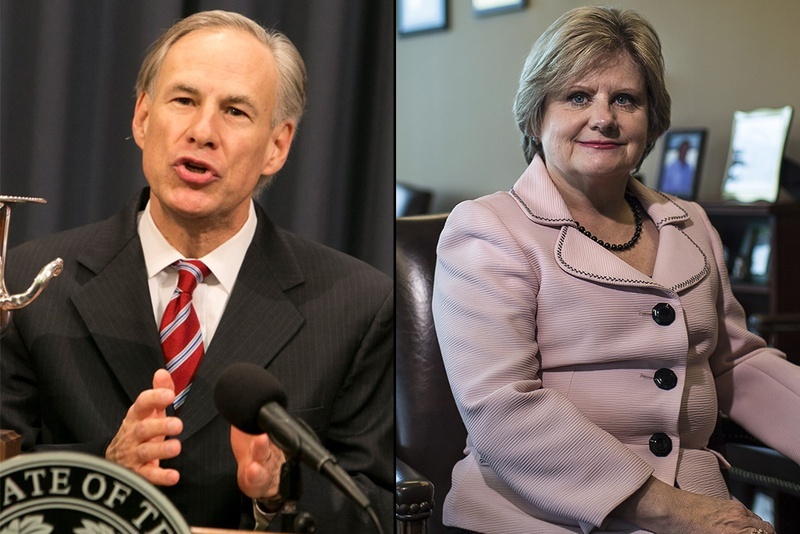 The one on the left is Abbot, the governor of Texas. He’s a good guy. The one on the right is … ahem … the sheriff of Travis County. No, I’m not kidding. She’s not a good guy. She hates Texans. And she hates America. And she doesn’t look to me like she could find her way to the gun safe, much less protect anyone. Solution. Fire her and throw her in the state penitentiary with the general prison population where she belongs for (1) violation of the law, and (2) theft from the citizens of Texas. This is a prime example of collectivists. They are literally willing to impoverish people in order to fulfill their wet dreams of statist utopia. What is it with those folks down there is Travis County? Do they like abuse? I don’t think there is any question that the voters put Donald Trump in office, at least in the main, because they’re sick and tired of seeing their jobs go to Hispanics and Latinos, all the while observing the cash-based society they live in where they don’t do business via official channels where they would be taxed. And they’re tired of this cashless society since they have to endure the taxation to prop up medical care, SNAP, welfare and other support for cross-border workers. They’re tired of paying their share when others don’t. Paul Ryan doesn’t care about you or your views. Congressional Republicans are working with the Trump transition team on a solution for immigrants brought illegally to this country as kids, House Speaker Paul Ryan said Thursday. Hundreds of thousands of these immigrants gained temporary protections and work permits from President Obama. While campaigning for president, Donald Trump promised to undo those protections, putting the immigrants at risk of deportation, although he said last month he hoped to “work something out” to help them. Ryan didn’t detail what Congress and Mr. Trump would do about the program, called Deferred Action for Childhood Arrivals, or DACA. But when questioned on a CNN town hall by a woman who identified herself as a DACA recipient with a young daughter, Ryan told her he did not want to see her deported. “I can see you love your daughter, you are a nice person who has a great future ahead of you, and I hope your future is here,” Ryan said. Host Jake Tapper pointed out that Mr. Trump, during the campaign, promised a “deportation force” to round up the more than 11 million immigrants in the country illegally. Ryan dismissed that idea. It sure would be nice if we engaged in the fabrication of machine guns in violation of the NFA, and then had Paul Ryan on our side who wanted to help us “get right” with the law. But we haven’t yet made our voices heard in such a way that Paul hears them. Mark my words now though, he is compromised. I’ll guarantee it, I would bet every penny I’m worth on it. He is involved in the deep state, and someone has pictures of him. Mark my words. It’ll eventually be found out. And as for what you really need to know about Ryan, you have already heard it. Paul Ryan advocates universal background checks. There. That’s all you ever need to now about him. He is a communist. Case closed. On February 26, the American Bar Association’s (ABA) Center for Human Rights issued a white paper on the U.N. Arms Trade Treaty (ATT), which concludes that “the proposed ATT is consistent with the Second Amendment.” This conclusion neglects important facts about the treaty and the processes surrounding it, which we have explored in this four-part series. We have shown that while we agree with several of the ABA’s contentions, it ignores the fact that the ATT—like many treaties—is not designed for a nation with a federal structure like the U.S. The ABA also ignores the fact that the ATT goes beyond import restrictions on firearms by requiring signatories to prevent the domestic diversion of imports. The treaty may also invite the executive branch to take executive actions to restrict and control the import of firearms into the U.S., imports which comprise about 35 percent of the new firearms market. Finally, the treaty raises broader concerns about the application of transnational law to the U.S. These concerns are heightened by the fact that both foreign nations and some prominent legal scholars have identified treaties like the ATT as a mechanism to pressure the U.S. to change its domestic policies, and even to change the interpretation of the U.S. Constitution, including the Second Amendment. The question, then, is what the U.S. should do about this. The U.S. is sensitive to allegations that it is failing to fulfill treaty commitments, and it rightly takes its treaty obligations seriously. Because the ATT is a process that is designed to evolve and grow, it is impossible to know where it will lead. A new ATT conference begins today in New York, and we will be blogging from the conference. Listen carefully. No, the U.N. Arms Trade Treaty isn’t really that complicated. It is a nefarious plot against the second amendment. We’ve covered this in detail before. All that rubbish and claptrap about the treaty excluding civilians because it excludes civilian arms is a ruse. What it does is what Feinstein and Obama want to do within the framework of U.S. law, and distinguish between so-called “military weapons” and “civilian weapons.” Again – it doesn’t distinguish between you and a member of the professional military, it distinguishes between military arms and civilian arms. It would make illegal all sorts of firearms currently in circulation, as well as subject you to a set of rules, licensing and governmental checks that would make what Obama has proposed look like free utopia. Some things really are as they seem. Can Heritage at least try to get it right next time? Otherwise, it’s just wasted space and bandwidth. Critics of the move warn the closures will undercut efforts to intercept drug and human traffickers in well-traveled corridors north of the U.S.-Mexico border. Though the affected stations are scattered throughout northern and central Texas, and three other states, the coverage areas still see plenty of illegal immigrant activity — one soon-to-be-shuttered station in Amarillo, Texas, is right in the middle of the I-40 corridor; another in Riverside, Calif., is outside Los Angeles. U.S. Customs and Border Protection says it’s closing the stations in order to reassign agents to high-priority areas closer to the border. The last paragraph has all of the right keywords, but I told you what this is really all about Changes in Mexican Border Strategy. This aligns personnel with the objective of increasing transcontinental and cross-border traffic. It’s all part of a larger nation and state level plan to make the border less significant, make it easier to cross, and raise cross-border shipments of goods and products, especially with Mexican truck drivers. Mark Krikorian passed on a revelation that alone should have cost this administration the upcoming election. In the initial fight with drug cartels fighters, Brian Terry and his team shot beanbags rather than bullets. But the situation is really even worse than that. First it was confirmed that Border Patrol agent Brian Terry and his elite tactical unit initially fired bean bags at heavily armed dope smugglers. Now comes news that a Border Patrol training video is instructing agents that, when confronted by a shooter. they should “run away” and “hide”. Only as a last resort, if they are cornered, should agents get “aggressive” and “throw things” at the perps. Throw things? Really; here’s the site of the largest local of the Border Patrol agents’ union describing the training they’re required to undergo. The site reports that the suits in D.C. have “offered to revise and clarify this training” — sure, only because it was exposed. It’s debatable whether Bill Clinton actually loathed the military, but this administration certainly loathes the Border Patrol. Securing the border would look so different than what we currently have that it would be indiscernible to the average American, and we aren’t prepared to implement what’s necessary. The border would have to come before trade and trucking deliveries, all traffic would be fully searched, the U.S. Marines would have to patrol the border, under arming orders, outside of the constraints of the Supreme Court ruling in Tennessee versus Garner, men with weapons would be shot by Scout snipers before they ever became a threat, and e-verify would be implemented on a national level. Again, don’t look for this unless something catastrophic occurs, such as Hezbollah fighters crossing the border and perpetrating acts of terror. Right now, trade and cheap labor on the backs of the American taxpayer are far too important to prevent “alignment of our assets with our strategic goals.” Expect more border station closings and a more diminished Border Patrol. EL PASO – Border Patrol agents might soon switch from sitting in trucks along the U.S.-Mexico border to helping traffic move more efficiently on the international bridges in this Texas city. This scenario comes from the idea of Border Patrol agents collaborating with other government agencies. Border Patrol Chief Michael Fisher in May announced a strategy to fight transnational crimes and drugs, support Homeland Security efforts and aid U.S. Customs and Border Protection. One possible outcome might be reassigning Border Patrol agents to Customs border crossings to reduce the long wait. “Currently Customs and Border Protection needs all of the staffing help that they can get – in particular at our ports of entry,” said El Paso City Representative Steve Ortega in an email. As Border Patrol agents apprehend fewer undocumented people each year, its mission as an agency with resources focused on deterring and apprehending undocumented crossers is being reconsidered. Currently, Immigration and Customs Enforcement personnel in the El Paso area of responsibility are apprehending and removing more undocumented people through the Secure Communities Program, employment raids and by catching crossers at major ports of entry than the Border Patrol, according to Border Patrol and ICE enforcement and removal figures. That is why the Border Patrol 2012-2016 Strategic Plan calls for redirecting its agents’ efforts toward relieving congestion and waits at the ports of entry, as well as combating terrorism and transnational crime. 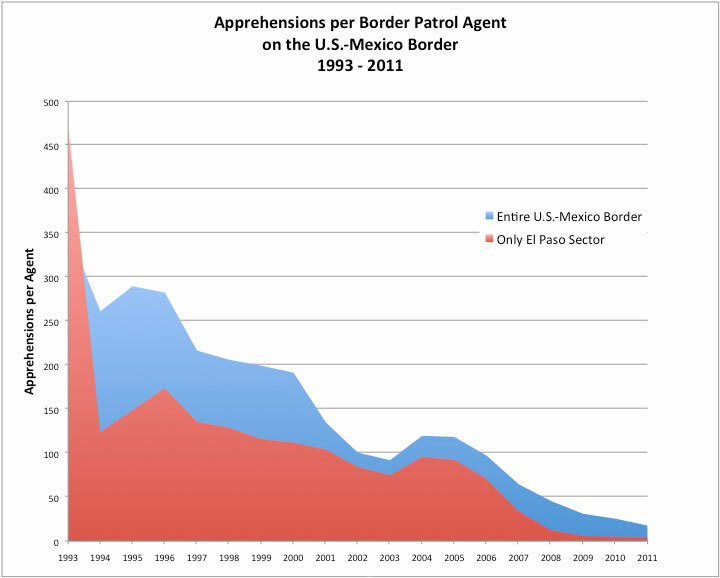 By the close of fiscal year 2011, the typical Border Patrol agent working from Texas to California was apprehending 17.7 undocumented people a year, from a high of 352.2 “illegal alien apprehensions” per agent in 1993. In comparison, the numbers fell even more for agents in the El Paso Sector, from a high of 470 apprehensions per agent in 1993 to only 3.8 apprehensions by 2011. More agents at entry checkpoints would be a relief for some people of El Paso. “People would cross to go to work, or to go to restaurants and enjoy the nightlife. They would cross to see family and they would cross to engage in trade. It used to be pretty easy to cross and it’s gotten more and more difficult,” said border journalist Louie Gilot. Gilot is the publisher of Newspaper Tree, a nonprofit online news organization in El Paso. Previously, she covered immigration issues as a reporter for the El Paso Times. For those who cross the border back and forth as part of their daily lives, long waits are too time consuming. “There used to be no lines when you were going on foot and now there is. I have spent an hour on foot,” Gilot said. The reason for the decrease in border apprehensions is more complex than simply painting a picture of success. The story being peddled here is that border security is improved to the point that the border patrol can now focus on making cross border traffic even easier and more efficient. The truth is that illegal border traffic is becoming more knowledgeable and efficient, the border patrol (and DHS) is under-reporting “got-aways,” and “soft metrics” are making things look better than they really are. The U.S. has operational control over only 13% of the Mexican border, regardless of the stories peddled in the media. This change in strategy has nothing whatsoever to do with being able to focus on efficiency because of improved border security. It is part of a larger push for more trans-border traffic which has been in the works for some time. U.S. and Mexican officials are meeting today as a first effort to decide where new border crossings and connecting roads may be necessary, reports HispanicBusiness.com. At the first Border Master Plan meeting today at the University of Texas at El Paso, representatives will begin identifying future projects, along with project priorities and timelines. Objectives will also include increasing understanding of the planning process and designing a process that ensures participation from everyone involved in the port of entry projects. Representatives from the Metropolitan Planning Organization, City of El Paso, the Texas Department of Transportation and the New Mexico Department of Transportation will also be present at the meeting, in addition to U.S. and Mexican federal officials. Just to make sure that you understand what is happening, read that last paragraph again: “The Border Master Plan is part of a national initiative.” Nothing is happenstance or happening by accident. It’s all part of a larger plan to make the border less significant, make it easier to cross, and raise cross-border shipments of goods and products, especially with Mexican truck drivers. Due to the facts that there are no arming orders for the National Guard troops on the border (causing the troops simply to perform clerical duties), misapplication of the rule of law to these troops (i.e., Supreme Court decision in Tennessee versus Garner), and confusion about the Posse Comitatus Act (i.e., the belief that it applies to border security caused by foreign threats), the law enforcement battle (fought with law enforcement officers, and not enough of them doing the right things) has been substantially lost at the border. This criminal insurgency crosses the border with as much ease as illegal immigrants, and the lack of border security is as much of a cause of the diminution of U.S. sovereignty and security as it is the increased cost of insurance, health care and other costs associated with illegal immigration and the influx of low skilled workers. The new strategy at the border isn’t without planning and forethought. It just isn’t the planning and forethought that one might have guessed would attend issues of national security. It has more to do with trade, facilitating transcontinental traffic, and enforcing the idea that the United States is an idea rather than a place. Recall that I told you “the National Guard has been “deployed” to the border to perform clerical functions and do overwatch and reporting,” and that the troops have been deployed without arming orders? Now this. The Pentagon began flying military helicopters and surveillance planes over the U.S. border with Mexico last month as part of an effort to withdraw all but 300 of the National Guard ground troops who have helped patrol the rugged border since mid-2010. The 19-month deployment of 1,200 National Guard troops on the southwest border has hurt recruiting efforts and threatened to strain diplomatic relations with Mexico, Brian J. Lepore, a director at the U.S. Government and Accountability Office, told a House homeland security subcommittee hearing Tuesday. About 12 Blackhawk helicopters and several fixed-wing manned surveillance planes began flying regular patrols over the Rio Grande in Texas for a mission called “Operation River Watch II” in March. The 300 troops will fly the aircraft, or analyze intelligence about smuggling routes in command centers miles from the border. The Obama administration deployed the National Guard to build access roads for border patrols and to help spot smugglers. The extra manpower was intended to bridge the gap while U.S. Customs and Border Patrol hired an additional 1,200 agents. In the first year, the National Guard troops helped apprehend 17,887 illegal immigrants and seize 56,342 pounds of marijuana, which was 5.9 percent of all apprehensions and 2.6 percent of marijuana seizures during that time, officials said. This is a great report, that National Guard troops “helped” apprehend 17,887 illegal immigrants. But wait. Further use of National Guard troops “could create a perception of a militarized U.S. border with Mexico,” State Department officials told the GAO. And we certainly wouldn’t want to create the perception of a militarized border. That would be worse than anything else. And speaking of perceptions, Lanny Breuer is at it again. Lying and creating false impressions, that is. Feinstein queued up the issue of “assault weapons” for Lanny, and he responded as intended. Thank you, Senator, for the question, and for your leadership on this issue. You have, of course, identified the paramount issue that we have to face as we deal with transnational organized crime from the Mexican cartels. That’s it. The paramount issue, without which there wouldn’t be any such thing as the Mexican cartels. American “assault weapons.” This deceitfulness will be held to account one day, but until then, it belongs in the same category as stupid border security reports like this one. Today, the Washington Office on Latin America (WOLA) and Mexico’s College of the Northern Border (COLEF) released “Beyond the Border Buildup: Security and Migrants along the U.S.-Mexico Border,” a year-long study on the impact of both countries’ security policies on migration. The study finds a dramatic buildup of U.S. security forces along the southern border–a fivefold increase of the Border Patrol in the last decade, an unusual new role for U.S. soldiers on U.S. soil, drones and other high-tech surveillance, plus hundreds of miles of completed fencing–without a clear impact on security. For instance, the study finds that despite the security buildup, more drugs are crossing than ever before. The study reveals that security policies that were designed to combat terrorism and drug trafficking are causing a humanitarian crisis and putting migrants in increasing danger. Migrants are often subject to abuse and mistreatment while in U.S. custody, and face higher risks of death in the desert. Also, certain deportation practices put migrants at risk. For example, migrants can be deported at night and/or to cities hundreds of miles from where they were detained. These same cities are also some of the border region’s most dangerous, where migrants may fall prey to–or be recruited by–criminal groups. In Mexico, approximately 20,000 migrants are kidnapped a year; many others face other abuses. “Decency demands more humane policies,” said Maureen Meyer, WOLA analyst and co-author of the study. In addition, “We have reached a point where any further increase in security will yield diminishing returns,” said Meyer. Yes, we may as well just stop everything and swing the borders wide open. Our buildup hasn’t helped. The possibility that it is a drop in the bucket compared to what it needs to be doesn’t occur to this team because they have different presuppositions than you do. They don’t want a secure border, so it’s easy conclude that there should be no buildup or change in strategy or tactics. The National Guard is bored, has little to do other than watch, isn’t under arming orders, and has sagging morale, while the administration is using the lack of security on the border as an opportunity to make political hay on so-called “assault weapons,” and study groups are more concerned about militarization of the border than they are border security. Don’t look for a secure Southern border in this generation unless something catastrophic happens to the U.S. homeland. By then it will be too late. The Mexican military has retooled, adapted and retrained to conduct stability operations within its own borders. Maybe it comes too easily after the wars in Iraq and Afghanistan, but in Mexico the word stirs cultural memories of heroic freedom fighters-not exactly the message that the government wants to convey-and drew cries of outrage from Mexico City, resulting in diplomatic retractions from U.S. officials. I have called the cartel and gang violence both warlord-ism and an insurgency. But of course, I have no romantic notion of insurgents as freedom fighters. The insurgents in South America throughout the last quarter of the last century were mainly communists. They weren’t fighting for anyone’s freedom from anything. But since South and Central America is steeped in Marxist thinking, and thus conflates freedom with revolution, Mexico City became outraged. Mexico City might prefer to think of them only as criminals, but at least they seem to be reacting to the problem with the correct tools. Still, insurgency or no, one thing is for certain: The cartels present a serious, multifaceted, and increasingly well-trained and well-armed challenge to the state, but Mexico is reconfiguring its armed forces to meet the challenge. As a result, the army and marines have started to look for alternatives to the older, thin-skinned Humvees-Mexico has produced several thousand in local plants in a deal with AM General-and toward a variety of new armored vehicles like Oshkosh’s SandCat, of which 250 have been delivered so far. The navy also has conducted operational testing of Renault’s Sherpa light scout vehicle, most notably in operations in Veracruz late last year, but has not made a final decision on whether to buy it. This is reminiscent of the need for MRAPs due to the IED threat in Iraq. Note that Mexico isn’t relying on the police to curb the violence. Mexico City has enlisted the assistance of the military in a big way, and the military is purchasing weapons and equipment needed for fighting large scale, violent, and highly effective insurgencies. Aviation Week continues into the weeds concerning equipment, organization of the Mexican military, and various problems they sustain due to inefficiency in structure. But continuing with this theme of warlord-ism, and insurgents, if we’ve learned nothing else from the campaigns in Iraq and Afghanistan, we understand the need to control the borders, even if we didn’t effect that control. The Arizona legislature might just act in lieu of the federal government to control their own section of the border. Gov. Jan Brewer could deploy the volunteers using $1.9 million included in the bill making its way through the state Senate. The militia itself was created by a law signed by Brewer last year. The Arizona Republic reports the bill has a hearing Tuesday before the Senate Appropriations Committee. Senate Bill 1083 has already passed one committee along mostly party lines. It would provide $500,000 in one-time funding and $1.4 million a year from a gang task force fund. The state is expecting a budget surplus this year, but lawmakers must deal with long-term debt and the May 2013 expiration of the 1-cent-per-dollar sales-tax increase, so it is unclear how much support this bill will receive. Former LEOs or not, they would be operating under rules that apply to everyone, i.e., deadly force can only be used in the case of imminent danger to life or sexual assault. It isn’t clear that they would even have arrest authority. What I have recommended is that the rules for the use of force be amended to move away from the Supreme Court decision in Tennessee versus Garner. This has also been termed “exempting the Border Patrol from the rule of law,” but I have recommended that the U.S. Marines be used to patrol the Southern border. The rules of warfare are clear. So the following situation is posed to help the reader understand how serious he or she is concerning security on the border. You are a border patrol officer, or a U.S. Marine, and you have charge of border security in your area of operations. A string of what appears to be several dozen illegal immigrants is heading across the border (and is now on the U.S. side of the border), as you have ascertained using night vision. In the front and bringing up the rear are two individuals, each toting what appears to be an AK-47, but what is most surely a weapon. No one has fired any shots towards you at this point. Is it morally justified to shoot and kill the individuals holding the weapons? This is a different question that is it currently legal.